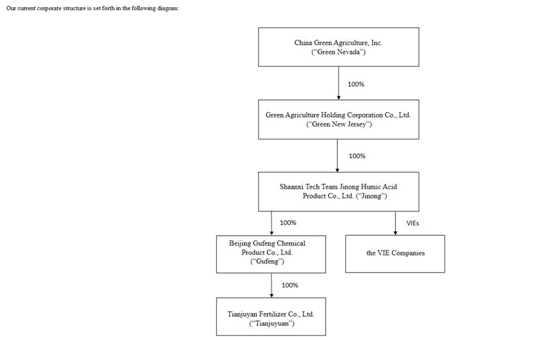 China Green Agriculture is a public company listed in the New York Stock Exchange with the ticker of CGA. We are registered in the state of Nevada with our main operations in the People’s Republic of China. Our principle operations are conducted through our PRC subsidiaries which produce and distribute humic acid liquid compound fertilizer, blended fertilizer, organic compound fertilizer and mixed organic-inorganic compound fertilizer throughout 22 provinces, 4 autonomous regions and 3 municipal cities in China. Our company’s competitive strengths are national distribution, brand awareness, state of the art research and development, automated production, and after-sales support. Our Company owns and operates two R&D centers: Jintai with 137,000 square meters and Yuxing with 353,000 square meters. Furthermore, we own two fertilizer manufacturing bases: Jinong and Gufeng with the annual capacity of 355,000 metric tons. The Chinese fertilizer industry is growing but has become highly fragmented since privatization measures were implemented a number of years ago. We have positioned ourselves to take advantage of this fragmented but consolidating industry. More specifically, the “green” fertilizer market is also experiencing significant growth due to a number of factors such as the deteriorating quality of land from the use of harsh chemicals, limited per capita arable land, China’s growing population, and global warming, which shortens the growth period of some plants and increases insect populations. According to China Daily, it is predicted that China will need 10 million hectares of additional arable land by 2030 to ensure food security. We are well positioned to take advantage of these factors and leverage our strengths to become one of China’s leading agricultural technology companies.